Passengers on a Delta flight had frontrow seats to a shocking display Tuesday after landing at Atlanta's Hartsfield-Jackson airport. 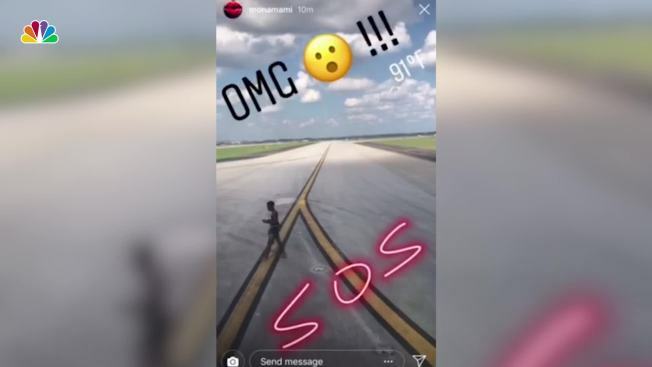 Shortly after 4:30 p.m., travelers aboard Delta Flight 192 coming from Miami witnessed a man on the runway in his boxer shorts. After scaling a fence, the man -- identified as 19-year-old Jhryin Jones -- jumped onto the wing of the plane and began to pound on the windows, according to Atlanta Police Department. Jones was on the tarmac for five minutes until he was detained at the scene. He was taken to the airport's precinct and faces charges of criminal trespassing, public indecency and obstruction of law enforcement officers.